Today was perfect. My mom loaded herself on the TrailRider, I was a little more work. We used a lift to load me on the TrailRider. The temperature was 24deg and bugs could have been worse. Three people had experience in the Sherpa position. We did a quick talk about the positions of the TrailRider, disc brake and harnesses and location of wheel. 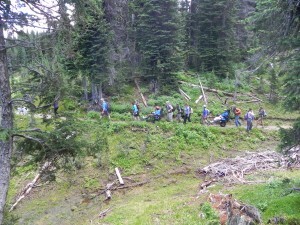 It did not take long for everyone to learn and safely propel my mom and me along Eva Lake trail. Flowers were just starting, white and pink mountain heather, paintbrush, lupine, scent of balsam pitch, and tall fireweed. First test was downhill and disc brakes, we learned quickly the brakes stopped everybody so fast including the TrailRider. The drainage on the hillside must have been alot of work for trail crews, ditches and rock crossings along with bridges to get a trail to beautiful lakes ahead. These obstacles did not pose a problem for the team. Who needs tough mudder race when you can get the same results with a TrailRider trip. The next leg of the hike was conversation like this ” rock right left or middle, little gap big gap, give er, break time, switch”. It was fun! The group totally beat the challenge. Next was lunch and pictures. We were passed and greeted by hikers from all over the world, checking out the TrailRider. I was told we weren’t far from Eva lake but the next portion of trail would be hard, so I made the call, let’s test the harnesses and get back up to summit. We marshalled at the s/b before the climb. The two harnesses and webbing were attached and before I knew it we were climbing fast. Everything was successful. Wonderful so happy you had a great day!